Explore the Wild Atlantic Way in West Cork on a sailing holiday that begins in Ahakista on the rugged Sheep's Head peninsula. You will discover islands in Roaringwater and Bantry Bays and be immersed in the beauty and character of our stunning Atlantic seascapes. Join us on a unique experience of sailing this magical part of the West Cork's Wild Atlantic Way and do it in style. Experience great food, meet wonderful people in beautiful locations. We'll set sail from the stunning village of Ahakista on the Sheep's Head peninsula which not surprisingly is an area designated as a European Destination of Excellence. As you connect with the rugged coastline and pristine marine environments around this undiscovered peninsula, you'll quickly realise the unique character of this magical place. You'll encounter three magnificent bays and sail close around the Fastnet Rock. 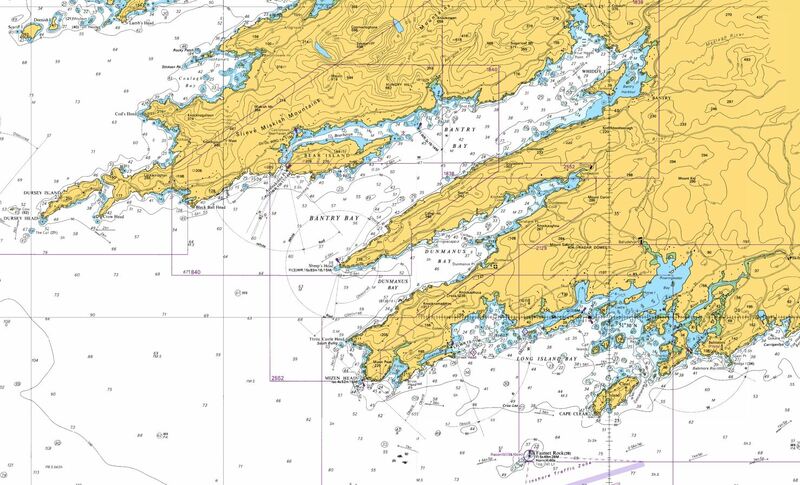 We'll also chart our course past West Cork's 7 inhabited islands. Spend time with their unique communities and experience the stunning natural habitats on Sherkin and Bere islands during your sailing holiday. You will get a real sense of what it is to live life by the Atlantic, at the very edge of Europe. We look forward to welcoming you to your Wild Atlantic Way cruise aboard our luxury yacht Merlin. Experience West Cork's stunning seascape from the comfort of an ocean-going Hallberg Rassy cruising yacht. We pride ourselves on our hospitality. All of your food is provided for you, and you'll get to sample the wonderful local produce for which West Cork is rightly famous like Durrus Cheese, Gubbeen Ham and salads grown right here on the Sheep's Head peninsula. To book the exclusive use of our Hallberg-Rassy 'Merlin' on a Wild Atlantic Way Sailing Holiday let us know your dates and we will endeavour to accommodate your request. The maximum number of guests is limited to 6 persons. Previous Experience Ideally you will have some sailing experience. However, we are happy to take complete beginners. Assumed Knowledge Although it is not necessary to have any formal sailing qualifications, some sailing experience would be beneficial. We would encourage you to participate in sailing the yacht under the guidance of your skipper. Cruise Destinations Depending on the cruise type from Ahakista there will be overnight stop overs in Sherkin Island and Bere Island where you can sample the hospitality of a real Irish pub. Experience Gained You will have experienced sailing in the Atlantic Ocean, rounded the iconic Fastnet Rock and the Mizen. Come into close quaters with curious dolphins, whales and seals basking on the shoreline. 120NM+ in your logbook for those on the three day trip. NOTE: Sailing passage route is weather permitting and we reserve the right to change the destinations and order for your safety. You will be met in Ahakista by your skipper. There will be a full safety brief on yacht systems. Set sail for Bere Island and Lawrence Cove Marina. On route, lunch will be served in a small bay close to Piper Sound which is the western entrance to Bearhaven. Take a short walk to the village of Rerrin on Bere Island and visit Murphy's shop and Des's pub. On your return to Merlin, tuck into a three course meal all freshly cooked on-board using the finest West Cork food with a bottle of wine. You are free to come and go from Merlin as you please. Morning starts with a full Irish breakfast before we set sail once again to explore the western end of Bantry Bay. From here we will make our return trip to Ahakista arriving around 16:30. You will be met in Ahakista by your skipper. There will be a full safety brief on yacht systems. We then set sail for Sherkin Island. On route, a late lunch will be served while at anchor in south harbour Cape Clear Island. On arrival on Sherkin Island, you acn take a short walk to visit The Travellers Rest or The Jolly Rodger pub. On your return to Merlin, tuck into a three course meal all freshly cooked on-board using the finest West Cork food with a bottle of wine. Morning starts with a full Irish breakfast before we set sail once again to explore Roaringwater Bay while on-route to Bere Island. Lunch will be served as we sail. On arrival to Bere Island, you can take the short walk to the village of Rerrin on Bere Island and visit Murphy's shop and Des's pub. On your return to Merlin, there will be another three course meal all freshly cooked on-board using the finest West Cork food with a bottle of wine. Click on the map to see our sailing holiday area starting from the dramatic seascapes of Ahakista on Dunmanus Bay.